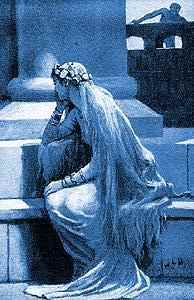 As a lark, Loki cut off the long golden hair of Sif, the wife of Þór, one night while she slept. In his rage, Þór demanded that Loki replace the hair, or else he would break every bone in Loki's body. Loki traveled to Níðavellir, the land of the dwarves, where he found the two dwarf sons of Ivaldi. They agreed to fabricate hair from gold, as fine as Sif's own hair, and with the magical ability to grow on her head. Once completed, they decided to make additional gifts to please and placate the gods. 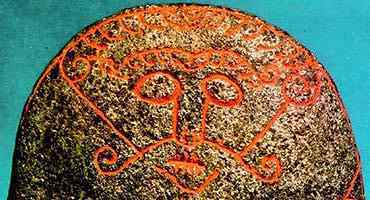 For Freyr, they made the ship Skíðblaðnir, which is always wafted by favorable winds, and which can sail on air as well as water. Not only can it hold all the gods and their mounts, it can be folded up and put in one's purse. For Óðin, they made the spear Gungnir, which never fails in its aim. Loki was so pleased that he declared the sons of Ivald the most clever of smiths. The two dwarf brothers Brokk and Eitri overheard. Brokk wagered Loki that Eitri could make three items that surpassed the three that Loki held. Loki agreed to the wager, with the stakes being the loser's head. Brokk worked the bellows while Eitri worked the forge. Eitri reminded Brokk that the bellows must be worked continuously without interruption to insure success. While Brokk pumped, Loki changed into a fly and tormented Brokk in attempt to force him to stop, and thus ruin the piece. Brokk was able to resist Loki's torments while Eitri made Gullin-börsti, the enormously fast golden boar for Freyr, and while Eitri made Draupnir, the gold arm ring for Óðin that drops eight similar rings every ninth night. But while Eitri was working the iron for a hammer, Loki stung Brokk above the eye, causing a torrent of blood. Brokk stopped pumping for only a moment to wipe away the blood, but the damage had been done. The hammer Mjöllnir, while still possessing its magic, was short in the handle. Despite the mishap, Brokk was still certain of winning the wager. Together with Loki, the dwarves traveled to Ásgarð and presented their treasures to the Æsir. The gods agreed that Brokk had won the wager. 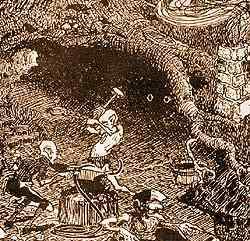 Loki fled at the thought of losing his head, but he was overtaken by Þór and returned to Brokk. As Brokk approached to take Loki's head, Loki pointed out that while Brokk had a claim on Loki's head, he had none on Loki's neck. The Æsir had to agree. Brokk, denied full vengeance, decided that since Loki's head was his, he could stop Loki's glib talk. Using Eitri's awl, Brokk sewed Loki's lips shut with a leather thong. After a time of silence, Loki managed to cut the thong and make plans for revenge.